LOVE GOD and to LOVE ONE ANOTHER. And the Great Commission will grow a Great Church and Great Christians. "Jesus said, Love the Lord your God with all your heart…soul…and mind. This is the first and greatest commandment. And a second is like it: Love your neighbor as yourself. All the Law and Prophets hang on these two commandments.’"
"Jesus said, 'Go and make disciples of all nations, baptizing them in the name of the Father and of the Son and of the Holy Spirit, and teaching them to obey everything I have commanded you.’"
Bring people into a relationship with Christ, which is evangelism and ministry. Build people up in their relationship with Christ which is worship, fellowship, ministry and discipleship. Send people out for Christ, which is again evangelism and ministry. "Bring them in…Build them up…Send them out"
Crestwood Church is affiliated with the Baptist Convention of Iowa (BCI), which is comprised of over 100 Baptist Churches who have organized for greater ministry impact. 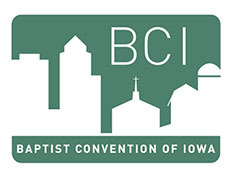 The churches of the Baptist Convention of Iowa pool their resources for ministry to new areas and population segments within Iowa and around the world, for mutual support, and disaster relief. Crestwood Church is affiliated with the Southern Baptist Convention, a network of autonomous churches voluntarily banded together to engage in missions enterprises and ministry activities designed to fulfill the Great Commission. The ministries of the Southern Baptist Convention include international and domestic missions, theological education, advocacy for religious liberty, production of church resources, insurance and retirement services for pastors and other church workers, and the infrastructure necessary to keep these cooperative efforts operational. Our doctrinal statement is the Baptist Faith and Message.